A Solar Smart Flower For Your Backyard! and have ample space in their backyard, solar smart flower comes as a ready solution. A solar flower is a fully integrated, all-in-one plug-and-play solar system. It comes with an intelligent tracking system automatically directing itself towards the sun and continuing to move throughout the day for optimal placement. A solar flower claims to be 40% more efficient than a traditional static solar setup. At morning sun rise, the solar flower unfurls itself and blooms like a real flower. Other than smart tracking of the sun, the Smart flower solar device also has many other smart features. The petals of the sunflower (solar panels) have tiny brushes attached on its rear surface. Every time the flower unfolds, these tiny brushes clean off the dust that accumulates on the panels. It is estimated that there is a 10-15% decrease in solar output when solar panels are dirty. The solar flower also has a rear ventilation system which reduces the overall temperature of the system by 18F, which also enhances its efficiency levels. The system has smart sensors which protect it from adverse weather conditions, as they have the capability of continuously monitoring wind speeds. 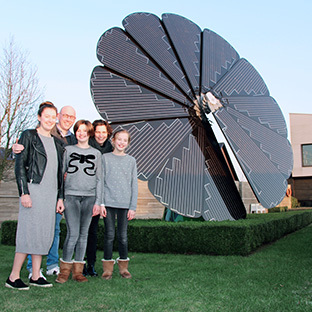 Not only is the solar flower more power efficient and will remarkably reduce your electricity bills, but it will also increase the aesthetics of your place. Here is a video that explains how a Solar Flower works! With solar getting more and more mainstream with each passing day, it is beginning to find more and more applications in our daily lives. You might also like to read our story on Solar Tree in India – which is basically solar panels arranged on a pole, in a manner that they harness maximum solar energy. Solar is now getting popularity in not only as the main technology in solar farms, solar parks or rooftops; but also in new solar innovations. Using solar should be the new way of life given its green credential and rapidly reducing costs.